I managed to free up a few days and decided to make a long drive north to chase down a few new native trout. I headed up past Alturas California and then up 395 a ways right to the border of Oregon and into the epicenter of redband trout diversity. According to Behnke there are seven distinct populations of redband in the neighborhood (not to mention some cutthroats, bulltrout and maybe some remnants of the extinct alvord). I had my sights set on two redbands and one elusive char. First up was the Warner Lakes Basin redband trout. This trout is found in a few creeks and streams in Oregon and just two in California. I wanted to get mine in California. The creek I fished was pretty skinny at it's headwaters and when I pulled up to where the dirt road crosses I was surprised to find a substantial herd of cattle on the creek. The creek was pretty well trampled here and very dirty from all the cattle walking through it. I managed to find some clear water upstream but it was darned skinny water. I dapped a fly over a grassy edge and picked up a trout. After the first trout I decided to head downstream a bit and see if I could find some water that might hold bigger fish. I found what I was looking for. The water downstream was great. I might have been in Oregon at this point but I didn't care. The creek was great, the water was ice cold and each pool held a dozen or so hungry trout. The water temp was shockingly cold for a high desert stream. 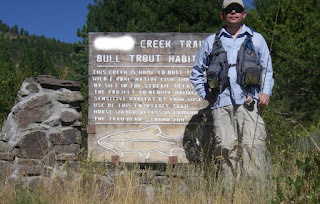 But what was even cooler than the water temp was how great the creek laid out for fly fishing. Incredibly spooky trout that could be cast to from a distance that rewarded a soft landing and well placed fly. I hooked a cast around the bush on the left in the shot below that drew a nice redband. As I moved upstream the creek got better and better with pool after pool full of wild native redbands. Me creekside in Northeast California. Or was it Oregon? Next up I wanted to catch an Upper Klamath Lake Basin redband. I dropped down into Lakeview and got an Oregon fishing license because for the next fish I was certain my fly would be landing in Oregon waters. From Lakeview I made my way north east into the Fremont National Forest. This creek is home to pure populations of both Klamath Basin Bull Trout and Redband Trout and if you enjoy crawling through the most choked thicket of alders, willows and who knows what else to emerge into ankle deep water flowing through a tunnel of vegetation where not only is standing out of the question but you can forget about wiggling that 7'10" one wieght than this creek is for you. Sometimes it can be harder to get a fly on the water at 3 feet than at 30 and let's not even talk about a good "drift". But when you do manage to get a fly on the water the reward is pretty sweet. I hiked about two miles up the creek hoping that it would open up a bit. Unfortunately it did not. The hike was nice and the canyon boxed up a bit but the creek was largely inpenetrable so I decided to hit another nearby stream that I thought might be a bit more "fun" to fish and that I knew to hold pure redbands. This last creek was spring creek clear, about 20 feet wide and had great trout holding structure and was a great way to finish off the trip.